If that is true, then by the end of the summer your IQ should be through the roof Just when you thought you couldn't get any smarter, along comes a nasty, dirty old tree root, and Hey! Presto! you're in Mensa! Just curious.....what do you think contributed to the fall? Could you have set up your bike to help prevent this sort of thing? Tire pressure OK? Shock rebound OK? Or was it just that angle at which you struck the root, kicked the wheel out from under you? BW is correct, in that tire pressure is a big deal in how a bike behaves on the trail. Running lower pressure really helps the tread stick to things like roots and rocks. I put about 25 to 30 psi when going off road; and about 35 to 40 when on smooth flat gravel such as rail trails. I think it was mostly inattentiveness. For the first time, I was really getting comfortable working both edges of the 3-5 foot wide trail picking my way through exposed rocks (or at least the sharper ones), exposed sapling stumps, and hitting the roots at a good angle or edging around them. I don't remember having a visualization of how I wanted to ride through this section - so too passive and just sitting on the bike instead of riding it? It's was only about a 10 foot stretch with a tree on the left, a mud-hole on the right, and a spiderweb of 2"-4" exposed roots spreading away from the tree. I didn't feel bounced around, so the shock settings seemed right (very Buick like ). In retrospect, I was also riding it too fast and my forward momentum was a significant part of the fall, but the forward-diagonal direction of the fall makes me believe the front wheel got pushed sideways. I am still in the process of gradually working my tire pressures down to see if I can feel any differences, finding a balance between what I can use on asphalt and off. The tire sidewall says 35-80 for minimum and maximum pressure, and I'm hesitant to get too close to that minimum figure, assuming that the higher recommendations reflect the lightweight nature of the tire. Another question. Lynn weighs less than 120, I weigh 180+. Do you adjust Terryl's pressures differently than yours to allow for the difference in weight? AHA, that was the last hard fall. I was skiing at Powder Mountain in Utah when someone lost their snowboard. 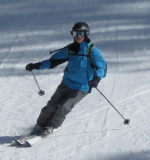 Just as I was turning left the snowboard went under my skis, my feet went right, and the rest of me went down. EXTREMELY glad I had a helmet on that day. Yeah, you have to be careful not to go too low, otherwise you'll start to get pinch-flats. That problem plagued me a few years ago -- I would get a flat almost every ride, and it took me weeks to figure out what was going on. Finally found that the sidewalls on the tires were very thin and could not support a lower pressure....swapped the tires for better ones with thicker sidewalls....proble m solved. As for different pressures on my bike vs. Terryl's, no, I have not played with that. But I have considered it. Kinda tough to generalize on this one, as a lot depends on the model of tire and it's strength/robustness. Certainly would be worth experimenting. I'll get back to you.....we are riding later today, so I may try that. BTW, I don't think you have to worry that running at 35 psi is too low-- to a road rider, that must seem very low, but for a mtn. bike it's perfectly OK. If my tire gauge is accurate, then we run about 35 to 40 psi for rides on our hard pack gravel rail trail, and that is plenty firm. Doing the thumb press test doesn't give much deflection -- it's pretty hard. No worries about pinch flats at that pressure. I drop it to 25 to 30 psi for rides in the woods, so I guess our present tires must have reasonably strong sidewalls, as we have not had pinch flats at these pressures. Having said that, our trails are not too gnarly -- no sharp rocks; just roots, some loose gravel and sand, but mostly hard clay. I could imagine that hitting a sharp rock at high speed on a tubed tire at 25 psi might cause a problem, but we've never encountered that. As an aside, that is why we don't need full suspension bikes here -- if we lived elsewhere where the terrain was rougher, we almost certainly would have rear suspension. But in our area, it's just not needed. The quickness and acceleration that we get out of a nice, light XC hard tail is just a blast, and there's nothing that a skilled rider can't handle here. BTW, I don't think you have to worry that running at 35 psi is too low-- to a road rider, that must seem very low, but for a mtn. bike it's perfectly OK. The quickness and acceleration that we get out of a nice, light XC hard tail is just a blast, and there's nothing that a skilled rider can't handle here. My worry is actually getting the pressure low enough that a 15 mile ride becomes a lot more "exercise" than I wanted. . Especially if the last 3-5 is returning on asphalt. And I think the idea of experimenting with weight related tire pressures and giving Terryl pinch flats might be problematic; especially if she has to fix it. Hmmm....I see..... Are the first 3 - 5 also on tarmac? Do you carry a small tire pump? Seems the only thing to do is let some air out when you hit the woods, then pause for a break when you reach the asphalt again and pump 'em back up. I have a pretty good little pump made by Topeak, and just a few puffs is all it takes to get the tires nice and firm. Like the pit crew at a NASCAR race, I can get the tires prepped speedy-quick. So, sorry to say, but the only thing to do is find a quiet shady spot by a stream, fortify yourself with a glass of chilled chardonnay from your picnic hamper, dip your toes in the water, sniff the flowers, and then pump away like a crazy man. So, if I call you how long before you are track side, Mr. Pit Crew?? Actually, we have the CO2 cannisters that you puncture as our emergency "air". Fits under the saddle, never had to use them yet. I expect that we will find a range of pressures that work with different types of rides and with the Karma tires. This last ride was very little asphalt, so 40 (or less) would have been a good selection. One of the other rides was 5 miles back road asphalt, 7 miles packed jeep trail gravel, and then 5-6 miles on asphalt back to the car, and that's probably still a 50-60 psi ride (for me, maybe less for Lynn). All this discussion has me curious. I need to go back over and take a picture of the tree root obstacle course. Just a suggestion......You might take a look at some of the mini pumps that are available, as a more versatile option over the CO2 fillers, at least for one of your bikes. It's amazing how good they are, and how little they weigh. Most cost about $20. Mine is maybe 3 or 4 oz., approx. 7" - 8" long, clips to the downtube under the bottle cage, and can get the tires rock hard in no time. Topeak brand, but not sure which model. I've had it for at least 5 years. Terryl has one about half that size that fits in her saddle pouch, weighs about 3 oz. It's never been used, and there for emergency only. Hint: if you get one that clips to the frame, make sure it has a dust cap over the nozzle, otherwise it will fill with grit. Not very clear pictures, but the first is the root that tripped me up looking back in the direction from whence I came. Three days of 90+ degree temps have dried up what was a mud-hole opposite the tree trunk, so now people can just ride around the roots. In the flood plain of a local creek, so very swampy. Almost looks tropical, at least in this section. I also think I tried to take a line too close to the tree. Should have gone to the other side (closer to the mud puddle) and then cut back across the trail taking the roots more head on. I think I had tires at 45 (which I felt was on the low end of the 35-80 range) and down from my normal 55 but still higher than everyone recommends. Point well taken. Just for the heck of it, try 'em at 30psi. Do the thumb squeeze test. You should be able to push it in just a wee bit, say 1/8" to 1/4" deflection, but they should still be nice and firm. I doubt you would get a pinch flat at that pressure, unless your sidewalls are REALLY thin. I assume you carry a spare tube and tire irons? Just want to reassure you on this tire pressure thing, as I'm sensing you're a bit reluctant to go lower than at present. I put all our bikes at 25 to 30 psi for trail use (35 to 40 for hard pack rail trails). The only time any of us have ever had pinch flats was with a cheap, thin-walled tire (I think it was Panaracer Smoke -- great tread pattern, but flimsy construction) that I had at about 25 psi or so. Too low for that tire. Otherwise, it has never happened with any other tire, and that over a cumulative total of at least 10 years of riding. I'm sure your Karmas will be fine -- that's a quality tire. A bit cautious, yes. But I'll get there, wherever there might be. A combination of the mfg 35-80 range recommendations on the sidewall indicating that the tire is designed for relatively higher pressures, and your comment about getting pinch flats at one point and deciding to go to a heavier and sturdier sidewall in order to run lower pressures. I also found myself wondering what would happen if I hit one of the many 2" saplings that were cut down to clear the trails (leaving about 4" of stump) and would the tires have enough structural integrity to absorb such an impact. And also thinking that, if the sidewall is "lighter weight" then I may get equivalent suppleness of the tread and the sidewall at a different target pressure than you feel with a stiffer sidewall tire. Thanks for all the help and information. And I do think that this last trail is at the challenging end of what Lynn and I are likely to ride. We didn't quite know what we were taking on before the ride, but did handle it better than we expected. ......your comment about getting pinch flats at one point and deciding to go to a heavier and sturdier sidewall in order to run lower pressures. OK, I give in......I just scanned a few online reviews and rider comments on the Karma, and lots of guys are commenting on the thin sidewalls and frequent pinch flats on these tires. Methinks your instinct was correct, sir. Probably not good to run less than 35 psi. Other comments: stay away from wet roots! (no joke!) And no sharp rocks (thin sidewalls). On the plus side, they all seem to love the light weight, low rolling resistance, and great grip on dry hardpack. Seems like a great summer tire for dry trails. And lets not forget that Lynn rode that same section right ahead of me with no problems - same tire. We need to remember that possibly the problem wasn't the bike or the tires. Pretty sure the next tire wiil be a Small Block 8 or a Slant 6, but I really don't have any complaints with current tires. They really roll well on hard surfaces and haven't disappointed anywhere else. Sadly, I never even thought of checking out the tire reviews online. Thank you sir Viking.